The Wall Street Mood Monitor is a three-factor model gauging the climate or “mood” for active management within each sector. The factors include sentiment, earnings trends and correlations. Sectors in the top right represent areas where active management conditions may be favorable based on positive earnings surprises and positive analyst sentiment, as measured by the number of upward revisions during the quarter. 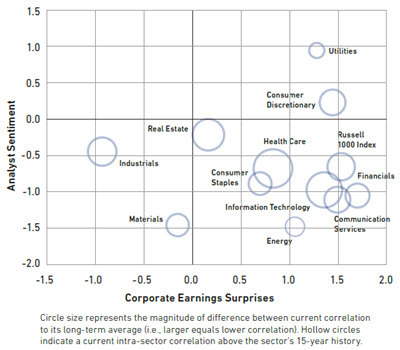 Correlations are assessed by comparing each sector’s current intra-sector correlations to its historical average. Larger circles represent lower correlations. Below we examine the three components of the chart in more detail, including earnings, sentiment and correlations. We gauge Wall Street sentiment by comparing the cumulative upward and downward revisions sell-side analysts make to their corporate earnings estimates. By that measure, the mood has become decidedly sour. The mood change on Wall Street has been a sharp one this year. In January 2018, an overwhelming 76% of all analyst earnings estimate changes were upgrades, a record level for the last 15 years. Upgrades continued in February and March, as analysts continued to factor in the benefits of corporate tax reform, but positive revisions started dropping in the second quarter and reached a nadir in December. While analysts’ outlook has turned sour, the earnings environment remains positive. For the fourth quarter, 55% of stocks beat consensus earnings estimates by at least one standard deviation. Conversely only 12% of companies reported earnings that were a standard deviation below consensus expectations. Earnings trends were strongest in the Technology and Communication Services sectors, where the percentage of companies significantly beating consensus earnings estimates stood at 71% and 59%, respectively. A surprising development this quarter was a surge in energy companies reporting earnings surprises. The surprise rate (defined as a one standard deviation earnings beat) surged 21% in the sector..
Correlations posed a stronger headwind for active managers than at nearly any point in the last three years. Intra-market correlations rose dramatically during the quarter as international trade tensions, the threat of rising rates and potentially slower economic growth sunk markets. Total intra-market correlations hit 0.64 this quarter. Other than a brief period in April, correlations haven’t been this high since late 2015. The long-term average for intra-market correlations is just 0.55. Correlations ran high at the sector level too. 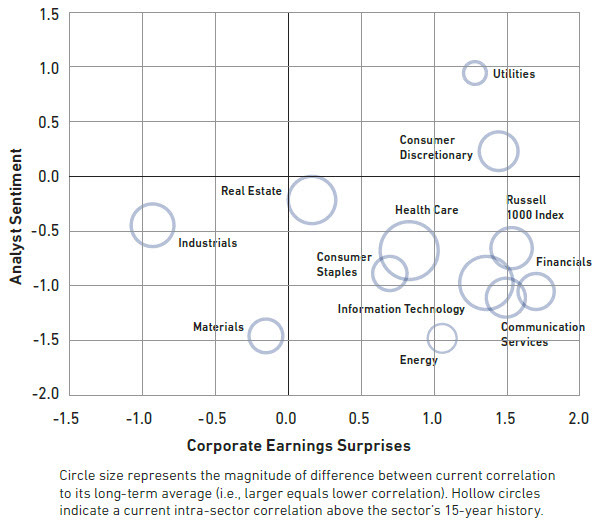 At year end, intra-sector correlations were above their long-term average for every sector in the Russell 1000 Index. The Technology and Health Care sectors recorded the highest correlation levels relative to their long-term averages. Higher correlations imply that individual stocks are being viewed more as a commodity and stock-specific characteristics are mattering less to investors. High correlations normally correspond to difficult environments for active managers. While rising correlations have made the market environment less favorable for active, the Utilities and Consumer Discretionary sectors offer more hospitable conditions than other areas. We use three factors to gauge the active management backdrop: correlations, sentiment and earnings trends. 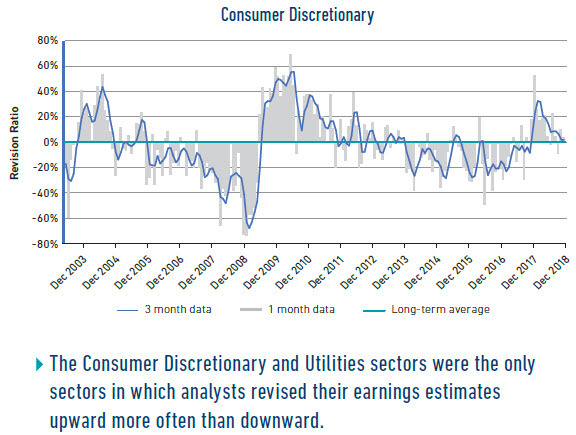 The Consumer Discretionary and Utilities sectors scored well on the latter two criteria. 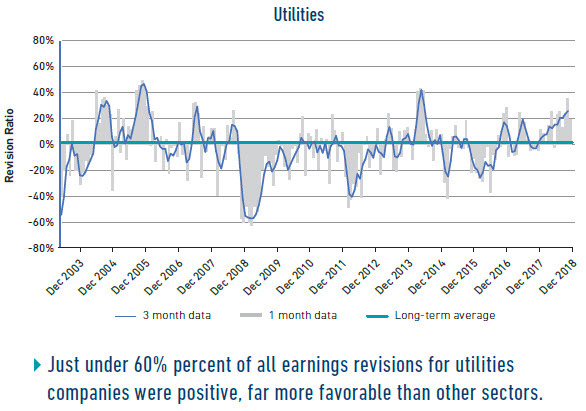 Wall Street analysts’ sentiment toward utilities stocks was far more favorable than other sectors, as just under 60% of all earnings estimate revisions for utilities companies were positive. 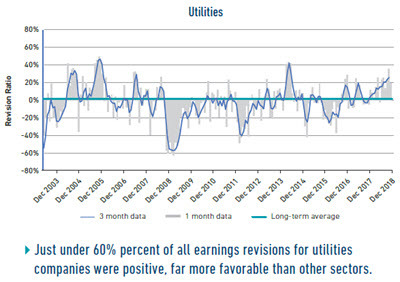 Earnings trends in the sector were also favorable, as nearly half (48.7%) of all utilities companies reported earnings at least a standard deviation above consensus estimates. Conversely, only 12.8% reported earnings at least one standard deviation below expectations. While intra-sector correlations for utilities stocks are above long-term averages, they are still hovering closer to their average than any other sector. Consumer discretionary companies continue to report earnings surprises at an impressive clip relative to the sector’s history. Fifty-seven percent of companies in the sector reported earnings at least one standard deviation above consensus expectations, while only 9% reported significant earnings misses. Currently, the ratio of consumer discretionary companies reporting significant earnings beats to those reporting significant misses is near its highest level since the mid-2011. Sentiment for the sector also remains relatively high. 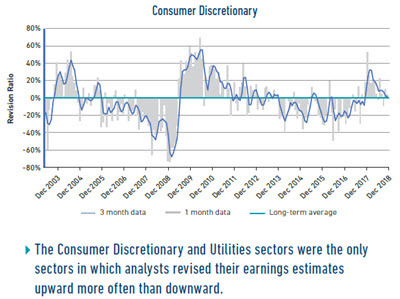 The Consumer Discretionary and Utilities sectors were the only sectors in which analysts revised their earnings estimates upward more often than they revised them downward. While earnings trends and sentiment remain positive for the Consumer Discretionary sector, intra-sector correlations soared above their long-term averages this quarter. This was true for every individual sector, however, and will likely pose a headwind for active managers. This piece is not intended to provide investment advice and should not be construed as an offer to sell, a solicitation of an offer to buy, or a recommendation for any security or sector by 361 Capital or any third-party.